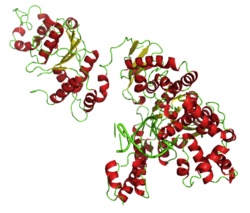 Taq polymerase is a thermostable DNA polymerase named after the thermophilic bacterium Thermus aquaticus. Thomas D. Brock originally isolated this bacterium in 1965. ↑ Chien A.; Edgar D. B.; Trela J. M. (1976). "Deoxyribonucleic acid polymerase from the extreme thermophile Thermus aquaticus". J. Bact. 127 (3): 1550–7. PMC 232952. PMID 8432. http://www.pubmedcentral.nih.gov/articlerender.fcgi?tool=pmcentrez&artid=232952. This page was last modified on 10 April 2014, at 16:51.